Shantung with Print Trim Jacket by P.I. Sport N.Y.
&#148;) signaled the author&#146;s burgeoning talents as both a poet and a novelist. The title springs from a line in Shakespeare&#146;s As You Like It. Hardy&#146;s trademark blend of pessimistic realism is only hinted at in the novel&#146;s lightly ironic touches and wouldn&#146;t emerge in earnest until two years later with Far From the Madding Crowd (1874). But there&#146;s much to be said for the uncomplicated pleasures of Under the Greenwood Tree. The story follows two intertwining threads. First is the downward spiral of the Mellstock parish choir, a rustic ensemble of cider-fueled fiddlers threatened with obsolescence due to the parson&#146;s majestic new-fangled harmonium organ. Second is the arrival in the village of a pretty new schoolmistress&#151;who happens also to be a crackerjack harmonium player&#151;and the ensuing kerfuffle when three local men, including the parson and at least one member of the parish choir, vie for her hand. The novel concludes with Fancy musing about &#147;a secret she would never tell.&#148; Readers of the book will recognize the secret. Viewers of the Masterpiece Theatre teleplay by Ashley Pharoah will have no idea that Fancy Day has a secret, let alone that she&#146;s intending to keep it to herself. This crucial element of the plot&#151;indeed one could argue that Fancy&#146;s secret is the plot&#151;has been inexplicably gutted from the story. Other incidents, nowhere to be found in the novel, have been invented out of whole cloth and given weird prominence as central plot points. Thus we&#146;re treated to elaborate but bogus set pieces such as a vindictive choir member sabotaging the harmonium by dumping a jug of hard cider into its machinery, and a drawn-out episode in which Fancy Day&#146;s father is seriously injured when his ankle is caught in the metal jaws of a mantrap. Nothing remotely similar to these events occurs in the pages of Hardy&#146;s novel. We expect this kind of desecrating rewrite of classic literature when talking about Hollywood movies, but less so in regards to Masterpiece Theatre, which has a reputation for being reasonably faithful to its source material. 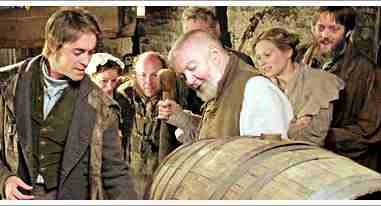 Not that tampering on occasion hasn&#146;t led to interesting results, like Alan Bleasdale&#146;s striking reconfiguration of Oliver Twist (2000). But Bleasdale&#146;s teleplay was touted as a unique enterprise. Under the Greenwood Tree is being deceptively presented as business as usual. This misguided adaptation does justice neither to Thomas Hardy nor to the venerable Masterpiece Theatre franchise.